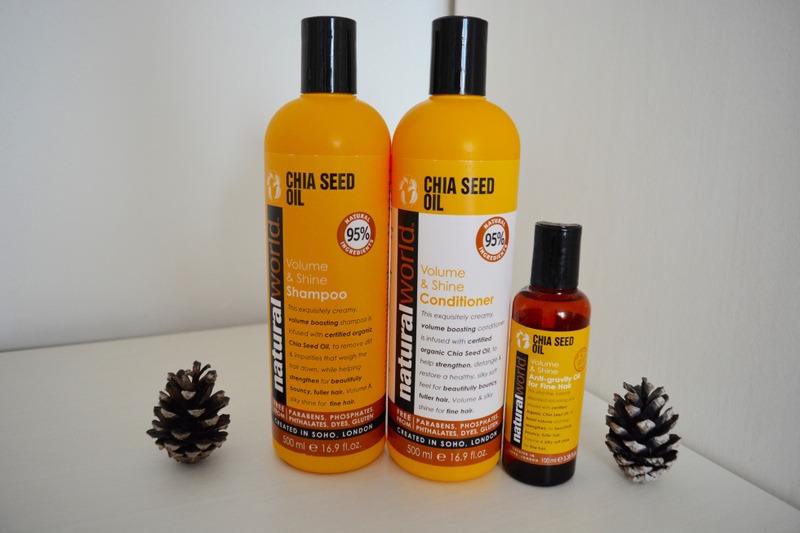 A while ago, I was sent the Chia Seed Oil range from Natural World and I couldn't wait to start using it. I'm a big lover of all things natural that may help my hair grow more and look better. I choose the Chia Seed Oil range as I felt it best corresponded to what my hair needed and I have never used any haircare products including it before. I have been using the range for over two months now and I love the results I am seeing, my hair has a new life to it. I also love knowing that my hair is being well kept after as it is a natural range and is very nourishing. The products also smell amazing and I love how good my hair smells throughout the day. The Chia Seed Oil Oil Shampoo & Conditioner helps to add shine and volume to hair. It has a creamy texture, which leaves hair feeling soft and locks in moisture. The shampoo and conditioner are both infused with certified organic Chia Seed Oil and 5 Essential Oils (Cedarwood, Rosemary, Lemongrass, Orange and YlangYlang). Chia Seed Oil is known to add volume, help strengthen, add shine and boost dull hair. The combination of oils results in silky hair with a beautiful bounce to it and thicker hair. I fell in love with the range as soon as I started using it, my hair has felt so much better and fuller. My hair smells incredible all day and looks a lot healthier. It truly has helped add a kick to my hair, made it more manageable and in my opinion my hair colour looks brighter. The oil is intended for those with fine hair, it instantly absorbs the oil and adds volume to it. Using the oil afterwards ensures your hair gets the full benefits of the range and feels so soft. I always use the oil on my damp hair and then dry it, it also protects my hair from heat damage and helps tame frizz. The combination of all 3 products (shampoo, conditioner and oil) ensures your hair looks more radiant and my hair hasn't felt as knotty, it detangles easier and just looks neater. I have loved discovering Natural World and am really glad I was offered to opportunity to try it out, I would definitely recommend it to a friend. I cannot wait to try out more from them and I think the Macadamia range is next on my to try list. You can buy the full range from this link.